Whatever happened to conservative Democrats and center Republicans? Emory political scientist Alan Abramowitz takes on that question in his new book, “The Disappearing Center: Engaged Citizens, Polarization, and American Democracy" (Yale University Press, 2010). In the book, Abramowitz explores the reasons behind the increasing gap between Democrats and Republicans, and the impact it’s having on law-making and party agendas. 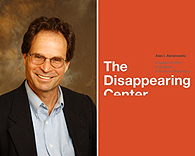 Alan Abramowitz discusses "The Disappearing Center."